A fast-growing Newtown-based business has won the Powys Entrepreneurship Award. 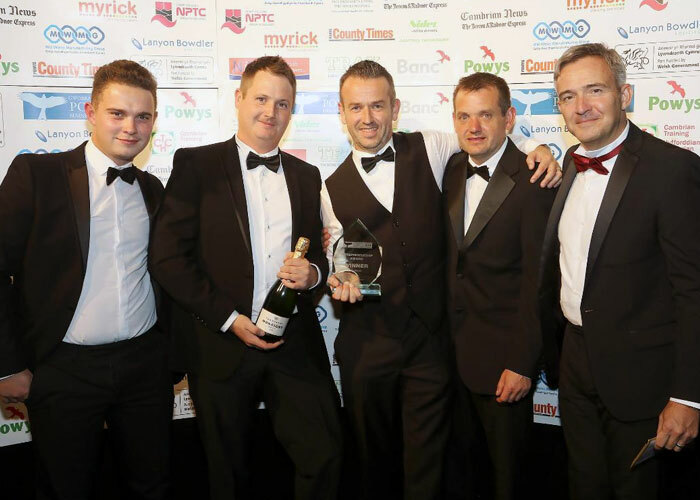 EvaBuild, which employs 35 people, collected the award, sponsored by Welsh Government, at the annual Powys Business Awards dinner at The Hafren, Newtown. “This award is great recognition for the hard work of everybody in the team at EvaBuild. EvaBuild increased turnover by a third and increased its workforce by 20 per cent in the last financial year. Future growth projections are set at 20 per cent for each of the next two years, which will take turnover to more than £5 million. To retain an advantage over competitors, EvaBuild is striving to attain the ISO 9001 and 18001 accreditations in addition to ISO 14001. One of the company’s core markets is providing groundworks in the modular building industry and EvaBuild recently partnered with Wernick Buildings, Swansea University and Specific in a ground-breaking project to construct a low carbon office building which acted as a power station, using systems to generate, store and release solar energy. In addition to delivering innovative construction solutions for clients across the UK, the company has also bought a parcel of land on the Vastre Industrial Estate and the Ladywell Shopping Centre with a view to reinvesting in and regenerating Newtown. “This move has been instigated by the need to inject ambition, innovation and sheer guts into private investment into our home town,” said Nick. “We are planning to demonstrate that regeneration has to come from within the community and by local businesses reinvesting will demonstrate that positive changes can and will happen befitting to the needs of local residents. “The company is very much committed to expansion and growth while keeping its roots loyal to Newtown and Powys. The growth of the company in both turnover and staff employed bears testimony to the meticulous and careful business planning and intuitive decision-making from the team led by Nick Evans.